The national parks in Florida host a wide variety of marine environments, from the tropical ecosystems of South Florida to the subtropical and temperate climates of the panhandle. Sandy beaches, mangrove swamps, barrier islands, and lagoons on the Gulf and Atlantic coasts make Florida's parks unique. In Florida, the U.S. National Park Service manages 12 different national parks, seashores, monuments and memorials, and together they receive nearly 11 million visitors every year. 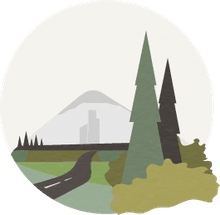 This article describes the most relevant parks, and their history and environmental significance. The Big Cypress National Preserve is located just north of the Everglades, at the southern tip of the Florida peninsula, and it supports the health of the neighboring Everglades by allowing the slow influx of water to enrich the marine estuaries on the coast. Big Cypress contains five habitats which have resulted from the mixture of tropical and temperate plant communities and wildlife common to the "frost line" location. Hardwood hammocks of oaks, wild tamarind, and cabbage palms are home to the Florida panther and Florida black bear. The Pinelands are made up of a diverse understory beneath a slash pine overstory, and they shelter the red-cockaded woodpecker and the Big Cypress fox squirrel. Wet and dry prairies in the park are floored with a thick mat of periphyton, a mixture of algae, microbes, and detritus. The cypress swamps, dominated by bald cypress trees, support river otters and American alligators. Along the Gulf coast are estuaries and mangrove swamps, where the freshwater from the swamp meets the saltwater of the Gulf. In this lush region, dolphins, manatees, and sharks give birth, and wading and water birds like egrets, herons, and pelicans thrive. Biscayne National Park on the southeast edge of the Florida peninsula is 95 percent water. Biscayne Bay is fringed by mangrove forests and the park includes nearly 50 northern Florida keys (ancient coral islands). The park also includes part of the Florida Keys reef system, the only living reef in North America, where blue neon gobies and yellow striped porkfish swim among golden-brown elkhorn corals and purple sea fans. Biscayne Bay is a shallow estuary, where freshwater from the Florida peninsula mixes with salt water from the sea; and because of that, it is a nursery for marine life with lush seagrass providing hiding places and food for a vast array of fish and crustaceans. The estuary supports soft corals, sponges and numerous invertebrates like spiny lobsters. Historical sites in the park include the ruins of the home of the Jones family, African-Americans who set up one of the largest producing facilities of pineapples and limes on Porgy Key in the late 19th century. Seven shacks on stilts are what is left of Stiltsville, once a thriving community of houses, clubs, and disreputable but popular bars beginning in the 1930s. Canaveral National Seashore is a barrier island off the central Atlantic coast of the Florida peninsula. The park includes 24 miles of undeveloped beaches, a productive lagoon system, coastal hammock area, south Florida pine flatwoods, and offshore waters. About two-thirds of the park is owned by the National Aeronautics and Space Administration (NASA). Kennedy Space Center is located immediately south of the Canaveral seashore, and on launch days, the park remains open but can get quite crowded. The name Canaveral means "place of canes" in Spanish, a name given to the island by Spanish explorers. Ponce de Leon claimed Florida for Spain in 1513, despite the fact that the peninsula was occupied at the time by the Timucuan Indians. Extant remains of the Native American inhabitants include several ancient shell mounds in the park, such as Seminole Rest, built and used between 4000–500 years ago. Canaveral sustains habitats for 15 federally-listed threatened and endangered animal species, including three sea turtle species, and migrating and permanent waterfowl and wading birds are at home there as well. Over 1,000 plant species have been found in the park. Dry Tortugas National Park is a 100-square mile park of open water at the far southwestern end of the Florida Keys, past the Marquesas and 70 miles west of Key West, and accessible only by boat or seaplane. It is situated on the main shipping channel between the Gulf of Mexico, the western Caribbean, and the Atlantic Ocean, and the wrecks of many of the ships can be found in the park's waters. The largest of the seven ancient coral islands is Garden Key, upon which the historic Fort Jefferson was built to protect the harbor. It is the largest all-masonry fort in the United States, and construction for it took place between 1846 and 1875, although it was never finished. The lighthouse on Garden Key was built in 1825, and another built on Loggerhead Key in 1858. Several idyllic diving and snorkeling sites can be found in Dry Tortugas. The most popular site is on Loggerhead Key, called the Windjammer Wreck, where an iron-hulled three-masted ship built in 1875 was wrecked in 1907. Wildlife in the park includes sharks, sea turtles, coral, lobsters, squid, octopus, tropical reef fish, and goliath groupers. Dry Tortugas is a world-class birding site, where 300 species have been spotted, including migrators like the frigate bird and sooty tern, as well as pelagic (ocean-living) birds like the white-tailed tropicbird. Everglades National Park, located in southwest Florida, has the largest mangrove ecosystem in the western hemisphere, the most significant breeding grounds for tropical wading birds in North America, and a nationally significant estuarine complex. In combination with Dry Tortugas National Park, Everglades National Park was designated an International Biosphere Reserve in 1978, and a World Heritage Site by UNESCO in 1979. 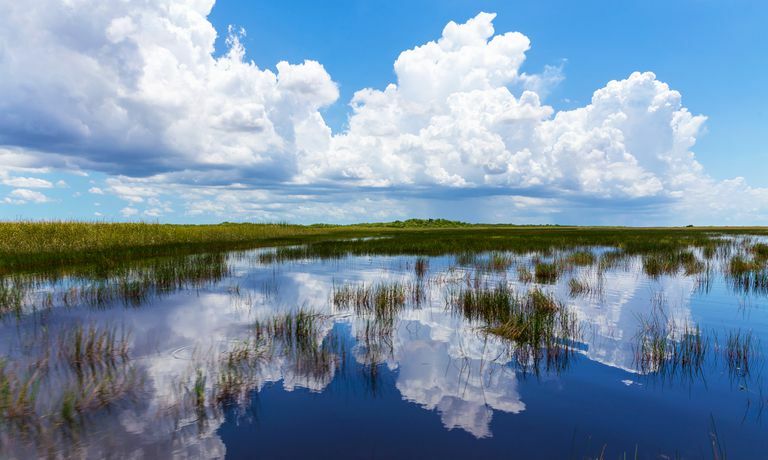 During the wet season, the Everglades is a low green landscape just inches above sea level, consisting of a broad sheet of water that slowly flows over and through the bedrock, discharging in the waters of the Gulf. During the dry winters, the most popular time to visit, the water is confined to pools. The landscape is interwoven with endless marshes, dense mangroves, towering palm trees, alligator holes, and tropical flora and fauna. As many as 25 varieties of orchids thrive in the park, as do 1,000 other kinds of plants and 120 species of trees. There are over 35 threatened or endangered species within the park, including the American alligator, crocodile, the Florida panther, the West Indian manatee, and the Cape Sable seaside sparrow. Gulf Islands National Seashore extends from Oskaloosa in the Florida panhandle westward 160 miles along the coast to Cat Island in Mississippi. The mainland and seven barrier islands making up the seashore share maritime forests, bayous, and rich marine habitats. The islands run parallel to the mainland to protect salt marshes and seagrass beds from all but the worst Gulf storms. The area serves as a nursery for marine mammals. Part of the Great Florida Birding Trail, Gulf Islands boasts 300 species of birds, such as pine warblers, pelicans, black skimmers, great blue herons, and piping plovers. Indigenous animals include bottlenose dolphins as well as cotton rats, foxes, beavers, armadillos, raccoons, river otters, American bears, and Gulf Island sea turtles. Located 10 miles offshore, Horn Island and Petit Bois Island were also designated Gulf Islands Wilderness Areas because they represent rare examples of undisturbed natural coast left along the northern Gulf. Up in the northeast corner of the Florida peninsula near Jacksonville is the Timucuan Ecological and Historic Preserve, one of the last remaining coastal wetlands on the Atlantic Coast. In addition, historic resources such as Fort Caroline and Kingsley Plantation make the park unique. The owners of Kingsley plantation grew Sea Island (long fiber) cotton, citrus, sugar cane, and corn on the island of Fort George, beginning in 1814. Zephaniah Kingsley and his wife (a former slave) Anna Madgigine Jai owned the plantation, including 32,000 acres, four major plantation complexes, and enslaved more than 200 persons. The plantation house still stands, and, about 1,000 feet from it, the remains of 27 buildings from the enslaved community also stand. Other historical places include a living history reconstruction of a Timucuan village; a reproduction of Fort Caroline; an early and short-lived (1564-1565) French fort and settlement built by and for the Huguenots; and the American Beach sand dune, a set-aside beach access for African-American citizens who were barred from the European-American beaches during the mid-20th century.